This lecture is co-sponsored by Architectural League of New York and generously supported by the Ornamental Metal Institute of New York. Kazuyo Sejima is a principal of SANAA, a Tokyo-based architecture and design firm she co-founded with Ryue Nishizawa in 1995. SANAA’s architects and designers work on projects ranging in scale from residential and interior design to large complex buildings and urban planning schemes, as well as product and furniture design. SANAA “approaches each project with a fresh perspective,” believing that designs “arise from conditions particular to the site and program.” Each project is closely followed by the two founding principals, as well as partners Yoshitaka Tanase, Yumiko Yamada, and Rikiya Yamamoto. Recent work includes the 21st Century Museum of Contemporary Art in Kanazawa, Japan, the Rolex Learning Center in Switzerland, and the Louvre-Lens in France. 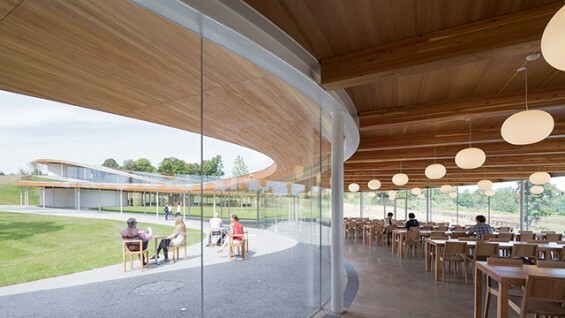 In the United States, SANAA designed the recently opened Grace Farms in Connecticut as well as the New Museum of Contemporary Art in New York and Toledo Museum of Art Glass Pavilion in Toledo, Ohio. SANAA’s current projects include the La Samaritaine department store in Paris, France, the Bezalel Academy of Arts and Design in Jerusalem, Israel, and the New Bocconi University Urban Campus in Milan, Italy. Kazuyo Sejima studied at the Japan Women’s University where she received a master’s degree in architecture in 1981. Shortly thereafter she worked in the office of architect Toyo Ito. Kazuyo Sejima has taught at Princeton University and Tama Art University among other institutions, and with her partner Ryue Nishizawa curated the 12th International Architecture Exhibition of the Venice Biennial in 2010. She and Ryue Nishizawa were named Pritzker Architecture Prize Laureates that same year.